Passage of Obamacare violated the will of the American people, and Florida District Judge Roger Vinson has concluded that it also violates the U.S. Constitution. In a carefully documented decision, Judge Vinson ruled that the “individual mandate” — the federal requirement to purchase government-prescribed health insurance — violates the Constitution, and he furthermore said that since the individual mandate is central to the workings of the health-overhaul law, it is not severable from the whole and therefore the whole law is unconstitutional. “Because the individual mandate is unconstitutional and not severable, the entire Act must be declared void,” Vinson concluded. This case, brought by Florida and 25 other states, is the highest-profile challenge to the health-overhaul law. Judge Vinson’s decision goes further than an earlier ruling by U.S. District Judge Henry Hudson in Virginia, which declared the individual mandate unconstitutional but let the rest of the law stand. Judge Vinson sided with the states and other plaintiffs in concluding that Congress does not have the authority to regulate “inactivity” — someone deciding not to purchase health insurance. He said if that were to be declared a new federal power, there would be no end to what Congress could mandate the citizenry to do. “It would be a radical departure from existing case law to hold that Congress can regulate inactivity under the Commerce Clause,” he wrote in his 78-page decision. Further, Judge Vinson ruled that the individual mandate is not severable from the rest of the law. He said the Obama administration itself argued at least 14 times in its motion that the individual mandate is essential to the workings of the entire law. “Congress’ failure to include a severability clause in the Act (or, more accurately, its decision to not include one that had been included earlier) can be viewed as strong evidence that Congress recognized the Act could not operate as intended without the individual mandate,” he continued. The case will surely be appealed by the Obama administration. Meanwhile, Congress will have even more reason to investigate the processes by which the wheels of the bureaucracy continue to churn out thousands of pages of regulations to implement the law. Today’s ruling throws the validity of the entire act into question and goes further than any other court decision to date. (So far two courts have declared the Patient Protection and Affordable Care Act unconstitutional and two have declared it does comply with the Constitution.) Unless the U.S. Supreme Court can be convinced to give an expedited ruling, the court challenges and appeals are likely to continue until a likely final decision in 2012. Posted on National Review Online: Critical Condition, Jan. 31, 2011. 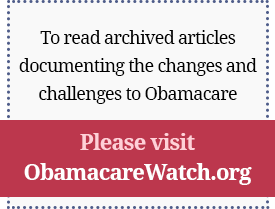 Previous Article: ObamaCare Claims Are "False, more so than True"